Just wooden signs. No conflicts with default mod. Notice: There can be some texture glitches (and now I don't know a way to fix it). Re-logging in game helps (sometimes). +1 going to have a play now! nice idea, i'll give it a try. 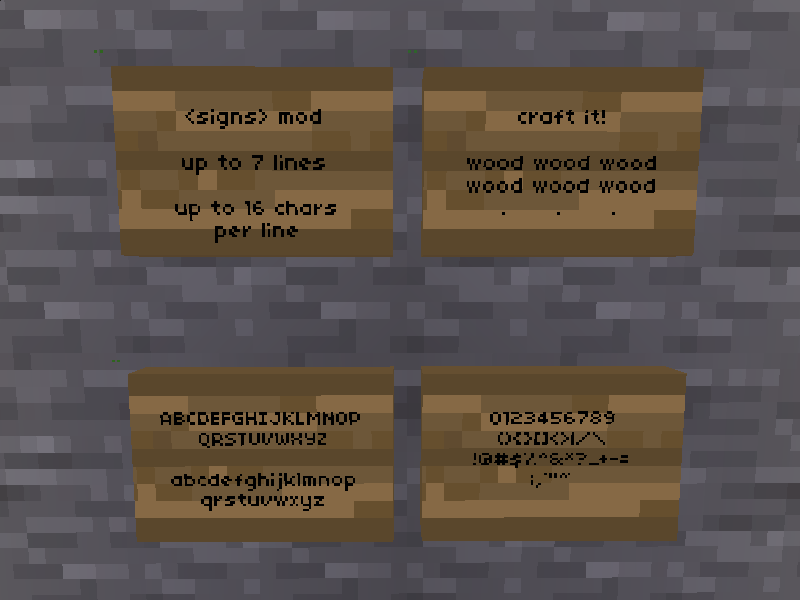 well it would look better if the sign texture had the same pixel dimensions that the font have. Try quiting & entering game again, that should help. awesome! now we do not have to worry about stuff around the sign being too bright and making it hard to see the text, because the text is actually on the sign. +3! Cool job xyz! i hope this get's added in the default game. Much better than the default signs. i installed it & it's cool! my text seems to disappear sometimes (maybe when someone joins). Relogging doesn't help. The text is still in the form. Only way to fix is to pickup and re-place the sign, and then write the text again. cornernote wrote: my text seems to disappear sometimes (maybe when someone joins). Relogging doesn't help. The text is still in the form. Only way to fix is to pickup and re-place the sign, and then write the text again. Can you report more information? What mods are you using? It seems that entity that displays the text disappeared, but I don't know a case in which that should happen. It reappeared on its own. I have a lot of mods and some custom things too. I'll try to isolate it with less mods. I don't store any variables in entities and this mod already have correct (I hope) on_activate. same as in minecraft... awesome mod !!! It's still not displaying the text sometimes. Is there a way that I can punch/dig/kick/spit it so that it re-renders? To read my signs i have to right click them to see the entered text. Last edited by cornernote on Tue Aug 14, 2012 00:23, edited 1 time in total. nice job! i was thinking about doing this but you got here first! Are there any plans to update this mod for the present builds of minetest? 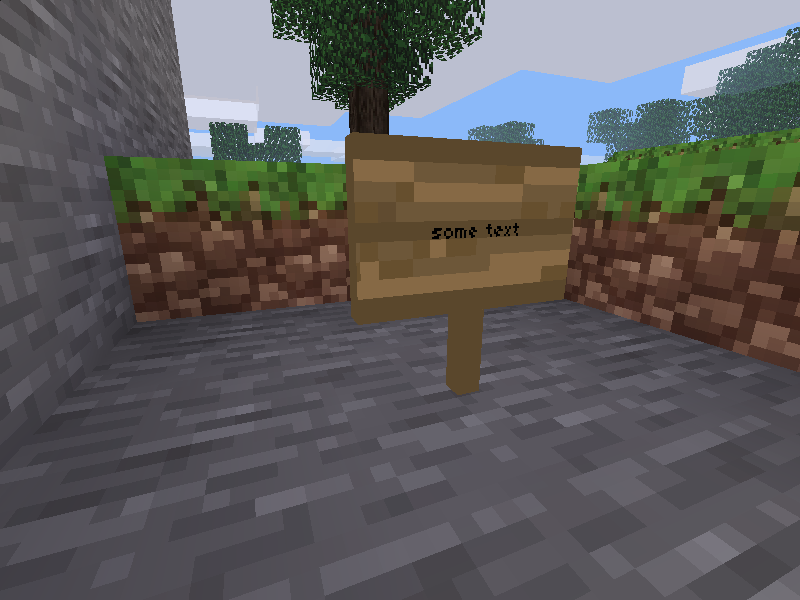 This mod has a few issues with the text messages on the signs. Sometimes, objects and even other messages get stuck to them. Other times, the messages will not show up. If it helps, Zegatron's Server uses this mod. Inocudom wrote: Are there any plans to update this mod for the present builds of minetest? This mod has a few issues with the text messages on the signs. Sometimes, objects and even other messages get stuck to them. Other times, the messages will not show up. If it helps, Zegatron's Server uses this mod. Does it? Zeg9 told me he uses PilzAdam's signs plugin, not this one. I see. If that is the case, then it is PilzAdam's version of this that I have seen those bugs with.